Camille Flammarion was born in Montigny-Le-Roy, today known as Haute-Marne, France, on February 26th, 1842 . He disincarnated in Juvissy, France, on June 4th, 1925. Flammarion was a man whose works enlightened the XIX century. He was the oldest of a family of four children, and at a very young age revealed exceptional qualities. He usually complained that time did not allow him to accomplish a tenth of that which he had planned. At four he already knew how to read, at four and a half knew how to write, and at five already dominated the rudiments of grammar and arithmetic. He turned out to have the highest grades at the school that he attended. In order to be able to follow the ecclesiastical career, he was enrolled with Vicar Lassalle to learn Latin. Through him Flammarion was introduced to the New Testament and Oratory. In a short time he was reading the speeches of Massilon and Bonsuet. Priest Mirbel spoke about the beauty of science and of the greatness of Astronomy and little did he know that one of his students was literally drinking up his words. That student was Camille Flammarion, the one that would illustrate and demonstrate the letter and the Gaelic-Roman significance of his name – Flammarion: “The one who carries the light “. The life of the Flammarion family was a very difficult one, and Camille understood his father’s merit when he decided to delegate everything he possessed to the creditors. He recognized in him, the most beautiful example of energy and work; however, that situation led him to live with few resources. After a long search, Camille finally found a job as an engraver’s apprentice, and received room and board as part of his payment. He had very little to eat and not of good quality. He slept on a hard bed, with the barest of comforts. The work was rough and his employer was very demanding, as he desired everything to be accomplished quickly. Flammarion intended to complete his studies, particularly mathematics, the English language and Latin. He desired to obtain a bachelor degree, and in order to achieve this he was obliged to study at night by himself. He went to bed late and not always had a candle. He usually wrote under the moonlight, yet he considered himself to be a very happy person. In spite of studying at night, he worked a 15 to16 hours day. He entered the School of Drawing of the Friars of São Roque’s Church, which he attended every Thursdays. Naturally, his Sundays were free and he managed to find a way to occupy himself. On this day he attended the conferences given by the abbot on Astronomy. Soon thereafter he was diffusing the association of the drawing students of São Roque’s Friars, all of the apprentices resided in the neighborhoods. His objective was to dedicate himself to the sciences, literature and drawing, which was quite an ambitious program. At 16 years of age, Camille Flammarion was elected president of the Academy, and when it was inaugurated, Flammarion’s opening speech was “The Marvels of Nature.” At that same time he wrote “Universal Cosmogony,” a book of five hundred pages. His brother, who was very close to him, and he became his bookseller and publisher. Also, at 16 years of age, he wrote his first work called “The World Before the Appearance of Humankind.” He liked Astronomy more than Geology. To summarize his life one could say: to pass with difficulty, to study excessively, and to work in exaggeration. One Sunday he fainted during mass, but in fact it turned out to be a providential fainting. Doctor Edouvard Fornié went to see the patient. Next to his bed there was a manuscript of the book “Universal Cosmology.” After seeing the work, Dr. Fornié thought that Camille deserved a better position, and promised, to place him in the Observatory, as a student of Astronomy. Upon entering the Observatory of Paris, which at the time was managed by Levèrrier, he suffered excessively due to the impertinences of the director’s persecutions. Levèrrier could not conceive of the idea of such a young man actually being able to understand studies of such a transcendental order. Leaving the Observatory of Paris, in 1862, he continued to pursue his studies more freely, thus being able to delegate to Humanity his most beautiful teachings on the silent areas of the Infinite. Free from the suffocating atmosphere of the Observatory, he published the “Plurality of the Inhabited Worlds,” that same year, attracting the attention of all scholars. In order to understand the direction of the aerial currents, in 1868, he researched about aerostatic ascension. His works, in a general way, rotate around the spiritist postulates of the plurality of the inhabited worlds. They are the following: “The Imaginary Worlds and the Real Worlds,” “The Celestial Marvels,” “God in Nature,” “Scientific Contemplations,” “Studies and Reading on Astronomy,” “Atmosphere,” “Popular Astronomy,” “ General Description of the Sky,” “The World Before the Appearance of Humankind,” “The Comets,” “The Haunted Houses,” “Narrations of the Infinite,” “Stellar Dream,” “Urânia,” “Estella,” “The Unknown,” “Death and its Mystery,” “Psychic Problems,” “The End of the World,” and others. According to Gabriel Delanne, Camille Flammarion was a philosopher crafted in a wise person, possessing the art of the science and the science of the art. 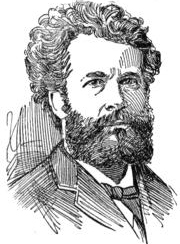 Flammarion–” poet of the Skies,” as he was denominated by Michelet—“became an exponent of Spiritism, because, he was always coherent had unshakable convictions, a true and innovative idealist.